you know, you try to do good in this world. you try so hard to be a good earthling and recycle. and this is what you get in return. 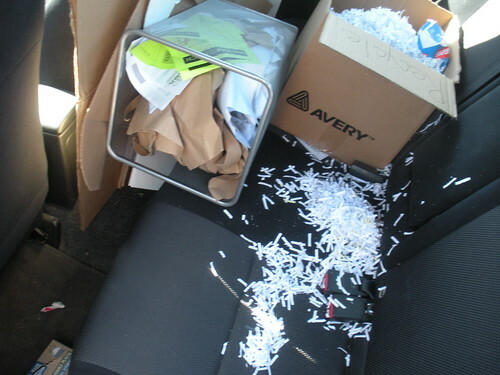 i’m just sad that every last paper shred won’t get recycled into an egg carton or something. here’s the video that i posted a couple weeks ago, they made a few minor changes and now it’s back online! in the meantime, the adoleo cd has been released!!!!!! get your copy today! this is a different kind-of life change. the kind-of change where i go from working two great jobs to working one absolutely amazing job. the kind-of change where i go from working 50-60 hours a week to working a solid 40 with some extra time on the weekends. the kind-of change where i go from not having time to do simple things like grocery shop to having time to be a good wife again, not just a bacon-bringer. this is the kind-of life change that will make it hard to quit my job and have a family someday. now, there are some skeptics [ahem, erik] out there that think i have a habit of getting a new job every couple of months…trust me, i’m sticking with this one as long as i can. readers, i have been offered my dream job. and i have accepted. i get the privilege of becoming veritas‘ new full-time coordinator! can you tell i’m excited?! i wanted to scream, but thankfully, i have a mother for that. she did scream. by the way. both of my bosses know [i would not be posting this if they didn’t], and they were both so awesome to talk to. i’m so thankful for believing bosses! God has been more than good to bryan and me this past year since we moved to iowa city. and He continues to dump on the goodness. thanks God! may was a long month. a very long month for this girl. i think may always seems long, every year. between spring busyness [let me hear you shout weddings! ], general anticipation for summer, and the whole 31 day thing, it’s just long. add working more than ever, teaching 37 kids for three days, and waiting for some very important news all month to those and you’ll get a very. tired. lisagrace. but hey! it’s june. and all of the above has been resolved, so life is on the up and up. because of lots of extra work for me [and triple paycheck month-love those!] and bryan starting his job at fareway, we set a hefty savings goal of $1,200.00. i’m happy to say we did that and $17.95 more! less than 75% to go! if you have a little extra time, here’s a funny student loan story, this is why i’m so glad God has given us so much wisdom with our finances. they make it so easy to take out more than you need in student loans! at the end of april, we officially filed the paperwork to apply for $5,500 worth of unsubsidized stafford loans. we’re certain we won’t need any more than that for the upcoming school year and are hoping we don’t need any of it, obviously, but it’s a just-in-case precaution. we were approved for quite a bit more than that, but we were careful to cancel all the other loans. when you fill out your paperwork, they automatically assume you want the maximum amount you were approved for so you have to cancel the ones you don’t want. isn’t that silly? anyway, a couple weeks ago, we got a check in the mail. a $6,200.00 check. just a check that said something about a refund on the memo, no note, no explanation, just a big fat check. we’ve never taken out student loans before, so i thought, maybe we’re getting our loan for next fall early, but why and why so much? if it wasn’t for the fall, then it was for this past year, and we didn’t pay even close to that much with the scholarship that bryan got. why would we need more money after everything’s done and paid for? this whole month i’ve been stressed about this tuition thing. things seemed so discouraging all month long. until this week. why am i ever ever anxious when i have this promise? God is definitely reminding us that He loves us and desires to take care of us. i’ve been working more hours at the coffee shop since the new store has opened, so that’s been a temporary blessing. bryan finally got a job! he is going to be working at the fareway meat counter. we found a great deal on a moped which will make it possible for bryan to get to work. (although, extra vehicle expenses are no fun either…) a dear friend connected me to an opportunity in which i will make an extra $300 for three days of work in may. praise Him! God also continues to teach us generosity, we wrote a few more checks this past month to summer missions trips. i want you to know that i don’t say this to impress you or feel good about myself, believe me, i wouldn’t say it all if i didn’t want to encourage you in this way. this has been something God has been teaching me a lot about lately, and i want to take this moment to share with you. also, check out this message from our old church. super convicting. my friend, mikki, who is in our amazing connection group shared the best perspective on tithing i’ve ever heard. she and her soon-to-be husband are both dental students and thus living off of student loans for the time-being. but she said something like this: whenever we tithe, we’re technically paying 7% interest or whatever it is on that loan money. but who’s to say that God’s work isn’t worth 7% interest? that hit me hard! what an awesome way to think about giving to the Lord’s work. so i want to say, before i update you, that if we have to take out student loans because we gave too much of our money away this past month, bring it on. i was not expecting to really put any extra in the bank, so i’m encouraged! march was an interesting month. we found out that we didn’t receive any financial aid for bryan’s last year of school. so, we had a long talk, went over some things in our budget and buckled down. more importantly though, god and i had a really awesome heart to heart. can i just say that all that stuff in the bible is actually true?! he is the god of all comfort and the great provider who loves us so much. i haven’t forgotten that his true and perfect act of love is all i need, and yet he continues to provide more! god is also the greatest, most gentle and patient teacher. he has been teaching me a bunch about his generosity and being open-handed with our money. the morning before we received our financial aid notification, i was sitting in church, listening to the message and god asked me to give a certain amount to the summer missions trips. i said okay and talked to bryan about it as soon as i got home. he agreed to this and then we found out that we didn’t get any financial aid. isn’t god’s timing funny? we wrote the checks, even though it was hard. that whole week, god tested our generosity. he kept reminding me of the countless times we’ve benefited from the generosity of others [you know who you are! ], and we both felt overwhelmingly that we should open our hearts and bank account to those in need. it has been such a blessing to follow god’s leadership in this area. especially because i have had a particularly tight grip on our finances, especially since we decided to move to iowa city. but when has god ever not provided for his children? i’ve been insanely encouraged by all of you i’ve talked to, or who commented on my last blog, or sent me emails of encouragement. thank you, thank you, thank you! sorry for the long, heart-exposing blog, but it happens every once in a while! we have progress! can’t wait to see what God does!